Instructions are available on the site. It's currently slightly over 4kb, so I'll have to optimize away some stuff. Perhaps I'll merge green and gray units into one creature that's both miner and weak fighter... Not sure. Any feedback would be much appreciated. Difficulty/balance, as well as what I can do to make it more interesting or fun, are the points I'm most worried about. It's currently not compressed and weighs in at far more than 4k, but it seems I'll be able to get it down to ~3.5k with grobo's toolchain. Remains to see if I can get pack200 and whatnot to work properly, though... I decided to ditch the half-finished graphics overhaul and stay with the old style which had more gameplay implemented. Perhaps, sometime in the future, I might change to the other graphics style for fun, but it's not on the list of things to do. Tentative name, we'll see what happens there... anyway, it's not really much of a game yet, just thought I'd share some WIP screens. The top screen is the game as it currently looks, with selecting ground and digging stuff and whatnot, and the lower screen is a test with another rendering technique I'm thinking I'll switch over to soon. It's inspired and partly based on some stuff made by DonTomaso, so cheers for that. How will you design the gameplay? Do you control the critters directly or indirectly with generals commands. Can you build corridors/rooms and such? I'm... not quite sure yet. There will be no direct control, but I haven't fully decided on the gameplay. It'll be a fairly simple affair I think, no rooms and stuff - something like mining gold while trying to save your guys from monsters or traps. Gameplay is nice too, keep us updated! @Gornova, Damocles: It's not actually isometric, it's some kind of orthogonal heightmap 3d~ish point cloud thingy that happens to be viewed from an isometric angle there. I'm thinking I'll change stuff around a bit to make it feel more 3d. dont' waste too much time on graphic, keep motivated with small playable demo!! Actually, I prefered the first design you proposed. It reminded me of the game "Holy Invasion of Privacy, Badman ! ", which has a very cool design. And like in this one, or like in Dig Dug or Boulder Dash, you may put a creature per square, with allied creatures having the possibility to swap squares if their ways are crossing. And having your creatures digging your gold independently of the player would distinguish your game from "Badman". @OP: that's yeah! because with mouse it will be look like starcraft. Heh... hmm, not quite starcraft, this game. We'll see how it turns out. EDIT: Moved info to top post, seemed to make more sense. This looks neat! plans on developing it further? I've elaborated some on the game, though I'm still not convinced of how playable it is. Any testing would be much appreciated! Any thoughts on balance / progression / difficulty? Hey this was neat, with a bit of work could be really good. I would also say move the gold to the top right hand corner. It feels weird buying stuff from the right but looking to the left to see you money. 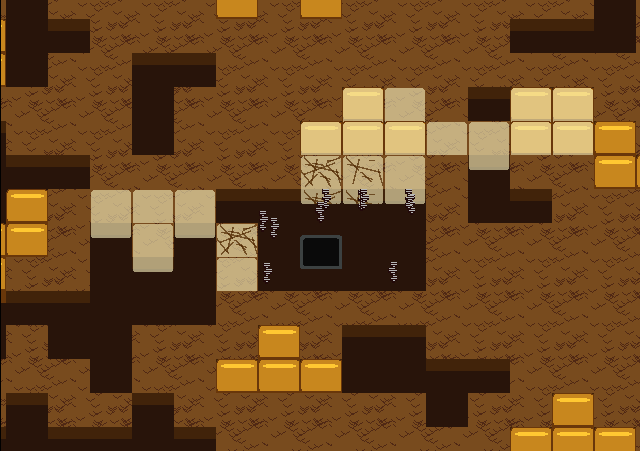 Imo an enemy ai that digs and collects artifacts + gold as you do. Artifacts when found are taken and stored at your starting area. Enemies will steal the artifacts from you and you can do the same back. You can also add defences to your base, traps etc. Regarding pathfinding, I definitely agree. I might do something about it if I find the space, but I'm unsure if I'll be able to. Ctrl+left-click should work already - I'm not actually checking right-clicks, I'm checking left + modifier key. Did you try it? Regarding moving the gold, I chose different side for resources/artifacts (left) and buttons (right) simply to more clearly distinguish interactive elements. I'll give it some further thought. As for the gameplay ideas, they're all interesting, but I'm already over 4kb after compression. I'll likely have to cut features as it is... unless I can come up with some magic trick. I have several other ideas queued that I'd like to implement if I find the space, including more things for level progression and some more interesting terrain features. I'm also planning to decrease the number of artifacts you need to collect, as well as the number on each level, in order to make them feel more special. Left click + mod does work, my apologies! Perhaps the need to upgrade tools to mine different grades of soil? Cool game. 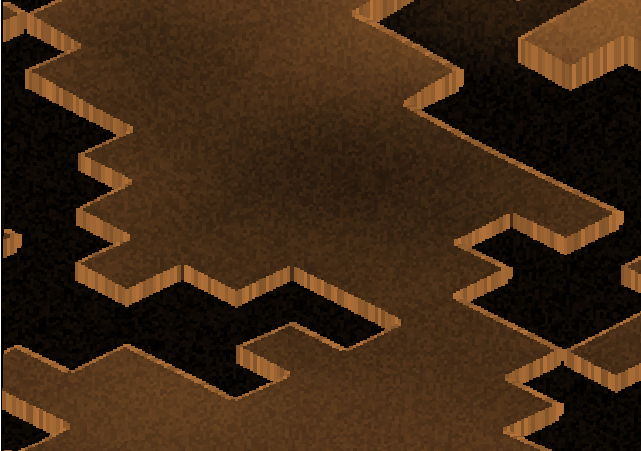 I appreciate particularly the procedural generation of each map and the command set. It would be nice to see some special squares on the edge of the map, to know the size of your domain. I noticed some strange white lines coming from the artifacts and going nowhere... Was it a bug ? Did you use Proguard, Pack200, Kzip and Zip2Gzip, i.e. Riven's compressor tool chain, in order to get your final jar ? Yep. Well, I used groboclown's ant tasks, but I think they're virtually the same. The UI and command set are really the stronger point of your game. Concerning the gameplay, I wonder how it would become if the action was twice as fast. Indeed, I especially regret that the beginning of each level is a bit slow. Can you tell us more about the upgrades ? Is the one with a triangle related to speed or attack ? And the one with a shield symbol, is it only related to defense ? The triangle is speed, which boosts worker speed by 50%, and the other one is an armor upgrade, which gives your units evasion - it was easier to implement with few bytes than unit hit points. On start all unit move very slow. Is it like that or something wrong with fps, I dunno. Then I guess it's not frame rate problem, since the units move as I click (quite responsive). I'm just too impatient.